I am writing this blog post as a reminder for everyone to learn more about Cryptocurrency and Blockchain. I know some of you have been investing in it, some of you would think that it is a scam. It’s ok. I know Cryptocurrency since 2016, when a Bitcoin was below $1,000. I thought it was a bubble. I thought it was a scam, why would a virtual currency with no underlying assets worth that much? Fast forward, I heard about it again when a Bitcoin was around $3,000. My friend shared on Facebook to remind people to buy it. I ignored it again. I thought, “Wow, the bubble is going to burst soon!”. Of course, I was wrong. The reason I believed it was a bubble, is because I firstly “treated” Cryptocurrency with my experience in investing in public stocks and my about foreign currency. But they are not. During October and November, two of my good friends shared to me about what they have learnt about Cryptocurrency and why it matters. Even until that time, I was still so skeptical. The price of Bitcoin had gone up to $6,000 – $8,000. I was curious, so I started to learn more about Blockchain, Bitcoin, Ethereum, Stellar, Ripple, and many more. I was hooked. I read about the technology, the use case, the team, why it went up, why i went down. I read day and night, literally, in order to keep up with the latest innovation on Blockchain. That’s also the reason why I have to write this blog post. Boy, I hope I had read about all of those in 2016 when I first knew about it. If only I were more open-minded that time. 1. Yes, It is a bubble, but we are still far from a major crash. The price of Cryptocurrency IS a bubble. As much as I believe in the future of Cryptocurrency, there is so much of “new money” coming in from non-tech background. It causes a mini bubble that have burst twice between December 2017 and January 2018. In December 2017, the global market cap of Cryptocurrencies went down by 30% from $600 Billion to $400 Billion. It recovered and went up to global market cap of $800 Billion, then around 13-15 January 2018 it went down to global market cap of $450 Billion. Today, on 21 January 2018, the global market cap is at $600 Billion. Crazy? “New money” does not understand Cryptocurrency, so they buy due to FOMO (Fear Of Missing Out) and panic sell during crash. Despite all the ups and downs in prices, Cryptocurrency is still at its infancy. It is the start of a new era of capitalism and technology. The current market cap is still small considering the internet / dot-com bubble popped at $3 Trillion (Nasdaq). That is still far from the current global market cap of Cryptocurrency at $600 Billion. The dot-com bubble happened in US. Now the investors and speculators are at global scale for Cryptocurrency, do you really think the bubble will burst below $3 Trillion market cap? The graph above is until 2005, let’s see what happened next? 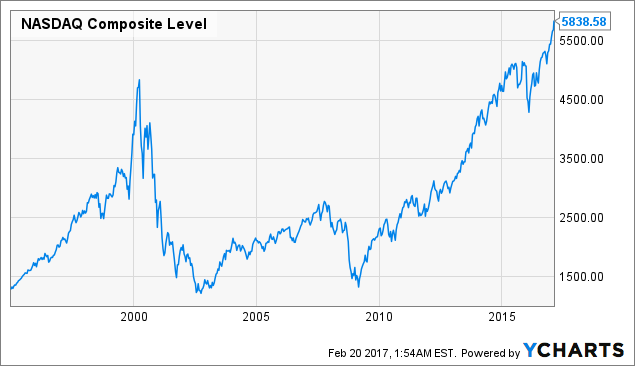 Nasdaq needed 10 years after the crash to recover the loss. It went up quickly and went down quickly when the bubble popped. Then it went up steadily even until today at 2018. As a rational investor, I think Cryptocurrency bubble should pop one day when the global market cap is above $3 Trillion, maybe not that early (considering it is a global phenomenon). Also as a rational investor, I think we will make a decent gain if we invest today, at a market cap of $600 Billion. Even after the bubble pops, it will still grow steadily like internet stocks for a very long time. Still, many people focus too much on what should happen than what will happen. The current financial system and technology we have are too centralized. There is a single point of failure. As an example, central banks can keep printing money to achieve the right inflation rate and economic growth. This is also the cause of multiple financial crisis in our lifetime, namely mortgage / property bubble. If a bank is hacked, the money of the people can be stolen. A bank is like a giant treasure box, if you managed to get the key and open it, you can take the data and money stored inside. Blockchain technology offers a solution, what if you can store value (data/money) inside many blocks, decentralized around the world? It means, the data and money are not stored in a giant treasure box, but distributed in millions of tiny boxes around the world. So if someone wants to hack it, he needs to hack millions of computers. Btw, the “key” I have been talking about is using Cryptography. That’s for currency. How about for other applications? Triggers (TRIG) actually uses Blockchain to secure smartguns, so that these guns can’t be hacked and controlled by bad people. They are also planning to use the technology for supply chain, CCTV, and more. In normal situation, it’s all about who you know. You want to start a startup, you usually need Angel investor or VC to invest in it. Do you know that when VC invests, they also check your family background? This is not something everyone knows, but it is the truth, especially in Asia. I am not saying that there are no poor founders being funded, there are still a lot. But as an investor, it is safer to invest in someone with a wealthy background (Their families would have better connections and capital when needed). Once you secure capital, you can keep growing your startup until it is huge. Then only you go public (IPO) and raise another around from the public. This provides liquidity and the initial founders and investors start selling their shares at market price (usually can be a lot higher than initial investment). Today, you do not have depend purely on connection. If you build something valuable, people can participate and buy in. It’s like going public (IPO) on day one. With smart contracts, you can create your own custom token and sell it to your funders/investors so that they can benefit from your development and progress. the contract between token issuers and holders are stored securely in the Blockchain. It’s not like the normal contract paper that can be burned / teared / destroyed. If you have heard about ICO (Initial Coin Offering), you would have understood at startups nowadays can raise funding via ICO by selling their coins / tokens. This can actually be a good thing for the long run. The community is very young. Many 18 – 30 y.o. founders are building their own Blockchain startups, Cryptocurrency, and many more. There are also many Crypto-millionaires below 20. Those that bought in when they were teens. As of now, there are in total of 1,400 Cryptocurrencies listed on coinmarketcap.com with many more under development. The global market cap won’t stay at $600 Billion for long. Do you have a leftover storage on your computer? What if you can make money from it? Yes, this can be done via smart contracts on Blockchain. You can allow strangers you don’t know to store their data in your computer server. In exchange, you will receive a payment in a form of Cryptocurrency. You can’t access the strangers’ data and the strangers don’t even know who you are either. The transaction happens in the Blockchain. If you think that is bizzare, you should check out Golem (GNT). That’s what they are doing. There are many startups out there creating amazing solutions to everyday problems and inefficiencies. 5. You are investing in a tech startup (Not just virtual currency). The rational behind crazy price growth is this: They are startups. Most Cryptocurrencies are at the early stage of user adoption. They went public on they one. Everyone can see the growth they have never seen in public companies. Of course, do you know that the value of Facebook shares had gone up by more than 100 times since their first day of startup? Most people only invest in Facebook when it has gone public, when the company is maturing. It’s normal for successful startups to grow 10 times at the early stage. When you understand that, the dramatic price growth in Cryptocurrency can be justified. PS: Please take note that not all Cryptocurrencies went up due to real progress, more than 90% are just due to speculation alone. When you invest in Cryptocurrency, you have to think like a VC (Venture Capital), you have to be ready to lose all your money or make 10 times gain from your initial capital. It means that you need to learn about Cryptocurrency and Blockchain as a whole. You also need to be patient before selling the right investments, you could be making 1,000-2,000% if you picked the right one. Why would you sell it for 30% gain? With the wrong mindset, it is not easy for someone to invest in these startups. It takes fundamental understanding and long term mindset. As of now, January 2018, it is still early for anyone to invest in Cryptocurrency. By the time it is 2019, the global market cap won’t be $600 Billion anymore. If this is the first time you read about Cryptocurrency, you will remember today next year. It’s better for an investor to predict what will happen than what should happen.